Postmodernism has proven to be a troublesome concept to many, including myself, in that it undermines all notions of certainty, stripping everything from God to science of their established authority. If taken to one of its logical conclusions, postmodernism reduces humanity to a relativistic nightmare in which all is rendered meaningless, with one person’s attempt to create meaning potentially canceled out by their neighbor’s (is this where thy neighbor becomes a potential threat rather than a potential friend?). To make matters worse, quantum mechanics has now shown, time and again, that nothing is 100% certain in the realm of human knowledge; probabilities exist which can be used to predict outcomes, but no one can be certain of anything, not anymore—everything is possible and everything is in constant flux. This negative interpretation of postmodernism has sent many theologians, scientists, literary critics and philosophers (and anyone else who craves certainty) retreating back to their respective castles to withstand the ensuing siege by the forces of nihilism. They close and lock their gates, batten down the hatches, and wait for the storm to pass. Could it be true, as Nietzsche (2006), a major architect of the storm, claimed, “there are no eternal facts, just as there are no absolute truths”? I asked myself this question many years ago after reading Thus Spake Zarathustra, unsupervised, at the age of sixteen. The attempt to answer the question led into the labyrinths of Heidegger, Derrida and beyond until “The Great Doubt” of Zen Buddhism threatened to define me, to erase my identity. Due to the mechanistic nature of the education system, a system that refuses to accept uncertainty by emphasizing control, much of my personal journey, through high school and as an undergraduate in college, was necessarily travelled alone. This made it much more difficult than it had to be. However, as Nietzsche observed in the preface of The Will to Power (1967), I, too, “lived through the whole of nihilism, to the end, leaving it behind.” Not an easy task, mind you, because in order to get to the other side of nihilism one must be humble enough to admit that humans, contrary to our longing and our Western traditions, do not inhabit the center of the universe, do not have a monopoly on knowledge, and are situated, whether we like it or not, in uncertainty. It doesn’t have to be this way. 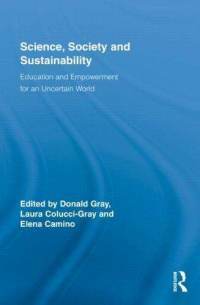 In Science, Society and Sustainability: Education and Empowerment for an Uncertain World, editors Donald Gray, Laura Colucci-Gray and Elena Camino have collected and organized eight essays which address the postmodern crisis and how it pertains to education and public discourse. The essays rest on an acceptance of the postmodern tenet that “there are no truths, only interpretations,” a concept the authors encapsulate in the concept of “post-normal science,” but this acceptance does not lead to nihilism. Quite the contrary. Instead, it leads to an opening, a clearing in which people can gather and dialogue, a place where greater understanding emerges, not truth but understanding, and it is through understanding that we learn to navigate uncertainty. Understanding is never complete, like the universe, it is in constant flux. This, at least to me, is good news in that, instead of partitioning human experience into theoretical quadrants of specific disciplines, thus stripping them of lived experience, genuine understanding accepts mystery as its jumping off point. The universe is a mysterious place. What’s wrong with that? Would anyone want to live in a world without mystery? Sure, it can be dangerous and uncertain, but what is the alternative? To be safe? To be certain? Understanding requires mystery, for if everything was understood and thus safe, evolution, it seems, the becoming of the universe, would cease. Game over. All of the authors agree upon a number of aspects being of the greatest importance for reflection on science and education: the growing awareness of complexity and uncertainty in the realms of science, society and environmental interactions; the greatly accelerated and unsustainable pace of change as a result of the power of science and technology to transform and manipulate the resources of a planet that is bounded and finite; the nature of current knowledge production and use and its social implications (including the rise of conflict); and finally, the need to expand participation and decision making processes with respect to complex socioenvironmental issues (p. 4). To the last point, that of expanding participation and decision making processes, the authors run the risk of assuming that consensus among a wider audience will necessarily lead to the best solutions. This would be a difficult position to defend. The fact, however, that the second half of the book is devoted to sustainable education, of developing the critical capacity in students so they are able to empathize with and evaluate a variety of perspectives, makes explicit that the participants in the discussion are educated. Just as a healthy democracy requires an informed citizenry, navigating uncertainty requires educators to equip students with the necessary tools to employ critical capacity across boundaries. In other words, not all opinions of are equal value and it takes a particular kind of education in order to engender peaceful and fruitful dialogues between disparate perspectives. This is the brand of education Science, Society and Sustainability: Education and Empowerment for an Uncertain World advocates: inclusiveness built upon a foundation of human critical capacity. If you are interested in promoting this crucial reform in the current education system, this book is recommended reading. If you happen to be a science teacher, you might consider it a must-read. Finally, the fact that works such as the above are becoming more widespread gives me hope that many students who, in the past, would have had to learn to deal with uncertainty basically on their own (shades of fear and trembling), can now look to educators for encouragement and guidance in helping them to help unfold the becoming that is the world and our potential therein. This is how it should be: what else would our schools be for? Nietzsche, F. (2006) Human, all-too-human: Parts one and two. New York: Dover Books. — (1967) The will to power. New York: Vintage.